(Board Book) Following the success of My First Hanukkah Board Book and My First Passover Board Book, My First Shabbat Board Book is a unique, bright, and engaging way to show preschoolers the meaning behind the Jewish Sabbath and the ways it is celebrated. Preschoolers will delight to see children making challah bread, lighting candles, and sitting down to a special meal with family, all the while learning why it is important to set aside one day a week to rest and reflect. By Sylvia A. Rouss Young Sammy Spider, who observed Rosh Hashanah, Hanukkah, and Passover in earlier titles, now celebrates the Shabbat (Sabbath) with the Shapiro family. From his vantage point of the kitchen window, he sees the Shapiros preparing for the coming of the Shabbat. As Mrs. Shapiro teaches her son to braid challah, Sammy braids his web along with them. This sweet story, told in very simple language, accurately portrays this Jewish ritual. Kahn's large, bright, mixed-media cut-paper illustrations enhance the childlike mood of the narrative. The last page offers a traditional challah recipe, the challah blessing, and the blessing over bread. Sammy Spider returns for another adventure with the Shapiro family. Sammy watches the Shapiro family prepare for Shabbat. He wants to celebrate Shabbat too, but he is told, "Spiders don't celebrate Shabbat. Spiders spin webs." So Sammy watches the Shapiros water their flowers, buy food for Shabbat dinner, bake Challah, and sing songs. In the meantime, he keeps putting off his mother's request to fix the hole in their web. He finds inspiration for a fun way to fix his web in a surprise place. Like all the books in the Sammy Spider series, Sammy Spider's First Shabbat teaches a concept in addition to the Jewish holiday. In this case, the different parts of the day are emphasized. Children will delight in the continuing saga of their friend Sammy Spider! By Sylvia A. Rouss Children will enjoy hours of creative activity when they celebrate Shabbat with Sammy. Through games, mazes, coloring, and craft projects, the loveable spider teaches children how to set a Shabbat table, make a tzedakah box, braid a challah and more. Sammy Spider's Shabbat Fun Book by Sylvia A. Rouss with creative illustrations from Katherine Janus Kahn is a fun and innovative introduction to the Jewish practice of Shabbat. Engaging its young children in a variety of games, quizzes, stories, pictures to color, and other activities, Sammy Spider's Shabbat Fun Book follows Sammy through an interesting collection of Shabbat-related activities, including an exclusive cut-out card game. Sammy Spider's Shabbat Fun Book is very highly recommended as a fun learning tool about this Jewish celebration event. By Maxine Segal Handelman A preschool class demonstrates the steps of challah-making-a special ritual of Shabbat. Photographs of preschoolers baking Challah highlight this delightful Shabbat book. The text is simple and conversational. The photographs are of an actual preschool class and the authenticity won't be lost on readers who will relate to the subjects in the pictures. The book includes a the Shabbat blessings and a recipe for the challah made by the students in the book. An excellent pick for preschool-aged children. By Diane Levin Rauchwerger and Jason Wolff When a dinosaur visits a young boy on Shabbat to help celebrate, he causes chaos. From baking challah to helping with havdalah, the fun-loving dinosaur leaves a mess in his wake. Third in the series of dinosaur holiday books including Dinosaur on Hanukkah and Dinosaur on Passover. This book is the third in a series of rhyming books to introduce youngsters to the Jewish holidays. This time, the dino arrives to inform the children that Shabbat is near so they must prepare for the weekly observance. He spills some wine on the tablecloth, falls asleep in synagogue, and generally behaves like a mischievous toddler, while clearly enjoying every part of the rituals. The inclusion of the Havdalah is especially welcome. The colorful and large illustrations are appealing and will be helpful at storytime. This book is the best of the series and will be heavily used by teachers in Jewish preschools. However, for schools without large Jewish populations, stick with the others in the series for a taste of mainstream Jewish tradition. Children will eagerly devour the adventures of the newest character to celebrate the Jewish holidays in the tradition of The Cat in the Hat. A boy describes how a dinosaur comes to visit and celebrate Shabbat ... with a little bit of chaos to spare. The dinosaur's antics will be sure to delight readers of all ages. Recommended for toddler and preschool readers. By Susan Remick Topek Noah enjoys nursery school, but looks forward to Fridays when the Sabbath bread "challah" is served at snacktime. Preschooler Noah is back for a tale featuring Shabbat. Noah attends a Jewish preschool. Every day, he eagerly asks the teacher if today is a holiday. He enjoys the activities throughout the week, but something is somehow not right. Finally, on Friday, Noah and his classmates celebrate Shabbat, a challah-day in school. Children will be able to relate to the typical preschool activities that Noah and his friends do together. An excellent choice for preschoolers. By Jan Goldin Fabiyi The simple text and brightly colored collage illustrations tell the story of a family celebrating Shabbat. Board book format is perfect for very young children. By Susan Remick Topek Look! What do you see? Three stars in the sky. A sensory look at the service that concludes Shabbat. Sweet, soothing rhymes explain to children about the Havdalah service. Each page highlights a different sense that is involved. ("Hear us sing the blessings", "Smell the gragrant spices"). 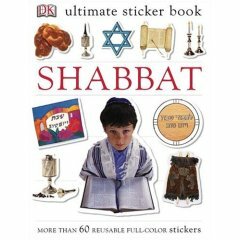 Children will eagerly read aloud the repetition of the phrase "Shalom, Shabbat. Shalom, new week." after each section. A great choice for preschoolers. By Mira Wasserman You can never have too much of a good thing-or can you? Roman King Antoninus loves the joys of observing Shabbat so much his kingdom celebrates every day of the week instead of just one, and learns a valuable lesson about Havdalah. This picture book retells a Talmudic story to stress why Shabbat is special. Roman King Antonius likes everything big: he lives in a big palace, eats big meals, and takes big naps. When he goes to visit his friend Rabbi Judah's house one day, he notices how small and modest everything is at the Rabbi's house. However, when he tastes the food, he finds it to be the most delicious food he has ever tasted. Rabbi Judah teaches the king all about Shabbat, the Jewish day of rest. The king, always liking big thing, decides that if one day of Shabbat is so wonderful, seven days of Shabbat must be even better! So the king decrees that the entire kingdom is to celebrate Shabbat every day of the week. At first, the villagers love their newfound period of rest. Eventually, they begin to notice that they are running out of food -- but nobody can tend to the fields. Their candles burn out -- but nobody can light them. Upon hearing of the king's troubles, Rabbi Judah returns to save the day by teaching the entire kingdom about the importance of Havdalah, the ceremonial end to Shabbat. This tale will surely be enjoyed by preschoolers and elementary school children. The moral that Shabbat is best appreciated because it only come once a week, will not be lost on young readers. A brief description of the Havdalah service and the Havdalah prayers are included. By Jacqueline Jules Bears don't live in Brooklyn, but both Shira and Jacob encounter one on their trip to the store to buy honey for Bubbe's Shabbos kugel. A whimsical fairytale to tickle the funny bones of old and young alike...and teach a few Yiddish words in the process. In this fun picture book strewn with information about the Shabbos, one of the three bears strays from his forest home and threatens to spoil a woman's Shabbos dinner in Brooklyn. When Bubbe begins cooking her special kugel, she realizes she has no honey in the apartment. One by one, she sends her two grandchildren and her husband to fetch the missing ingredient and each returns empty-handed, having been accosted by the hungry bear. "Are you meshugah? There are no bears in Brooklyn," Bubbe remarks, and decides to confront the culprit herself. The result is a delicious Shabbos dinner, with one very furry guest at the table. Jules's use of repetitive fairy tale elements will have children giggling and guessing at what happens next. The preparations for Sabbath and Bubbe's Yiddish vocabulary will be familiar to many Jewish readers and provide enjoyable and enlightening reading for children of other faiths. Kahn's deep-hued paintings, featuring an enormous googly-eyed bear, sustain the playful, warm mood of fantasy. Fairy tale fans will delight in this Shabbat tale based in Brooklyn. Bubbe spends Friday frantically preparing for Shabbat dinner in her 4th floor apartment. One day, she is preparing her noodle kugel and discovers that she has run out of honey. Not to be deterred from her task, she sends her grandson Jacob to the store. Unfortunately, he runs into a lost but hungry bear who roars, "Give me your honey or I'll eat you up!" Bubbe doesn't believe Jacob's story (after all, bears don't live in Brooklyn), so she sends her granddaughter Shira. When Shira and Zaide both return honeyless telling of a bear that stole her honey, Bubbe decides to get the honey herself and has enough chutzpah to save the day. Jacqueline Jules's hilarious conversational tone combined with Katherine Kahn's cartoonish illustrations make for a great story that children will want to read over and over again! By Maxine Segal Handelman Something is not right in the home of Chaim Yonkel and his wife, Esther. Usually their home is filled with the smells of delicious foods, the sounds of laughing children, and happy smiles on everyone's faces. But this Shabbat finds the family fighting, Shabbat dinner unprepared, and the house a mess. The Talmud tells the story of two angels, Tov and Rah. According to this legend, these angels follow each person home from synagogue on Shabbat and deliver a blessing. If Shabbat is being honored and the home is filled with Shabbat peace, the angel of good, Tov, gets to deliver the blessing that every Shabbat should be like this one. However, if Shabbat is not being honored, the angel of evil, Rah, gets to deliver the blessing, turning the same words into a curse. This contemporary version of the talmudic tale, illustrated with breathtaking illustrations by Joani Keller Rothenberg, updates the story for today's families. The Shabbat Angels will delight the whole family while it teaches the importance of Shabbat Shalom, Shabbat peace. This delightful book tells the story of two angels, Tov and Rah. Tov and Rah follow each Jewish family home on Shabbat and wish "May next Shabbat be just like this one". The Yonkel family usually welcome Shabbat lovingly, and thus the wish turns out to be a blessing each week. But one Shabbat, the parents got into a fight about something they couldn't even remember, the house was a mess, and the kids started to fight. As a result, the angels' wish turned out to be a curse. Although the family made up later that afternoon, it was too late. The next week, the curse took effect, and the shalom that typically filled their house on Shabbat was nowhere to be found. Upon consulting with their Rabbi, the Yonkels figure out how to make sure that the Shabbat Angels bless their home once again. Maxine Handelman delivers a delightful story to show the importance of peace and happiness for each Shabbat. Joani Leller Rothenberg's bright Chagall-like illustrations leap off the pages. Sometimes, the dark text get lost on a dark background. Overall, an excellent choice for reading aloud to preschoolers and early elementary children. By Sylvia Rouss Little Abby wants a pair of candlesticks like her older sisters. Her teacher helps her make her own glass candlesticks which light up everyone's Shabbat. On the heels of The Littlest Pair's winning the 2002 National Jewish Book Award in the picture-book category comes The Littlest Candlesticks, another title in the Littlest series by Sylvia Rouss, illus. by Holly Hannon. Couplets describe a girl's wish for her own Sabbath candlesticks, like her mother and her older sisters ("'Abby, just wait 'til you're a little older./ You'll have candlesticks,' her mother gently told her"). Abby's patience pays off the next week in preschool (her class is girls only, with all of them in modest dresses), when each girl receives a pair of "see-through glass" candlesticks to paint. The author of the Sammy Spider series and The Littlest Frog is back with a charming book about a girl who wants to be able to share in the mitzvah of lighting Shabbat candles. Abby watches her mother and two sisters light candles every Shabbat, but is told to wait until she is older. When her preschool class makes candlesticks out of glass jars, Abby diligently tries to determine the best way to decorate her project. Later, she enthusiastically helps prepare for Shabbat so she can reveal her new candlesticks. Sylvia Rouss uses a cheery rhyming scheme to make this an excellent choice for reading aloud. Includes the Shabbat prayer for lighting the candles (in Hebrew and transliterated into English). Then clean up, dress up for Shabbat! A lively rhyme about preparing for the Jewish Sabbath. This bright board book is a wonderful way to bring the excitement of Shabbat to young children. Pictures are bright and detailed and encourage children to find something new with each reading. The illustrations feature a family getting ready with their animal friends. Filled with lyrical rhymes, this book will engage any toddler or preschooler! By Cathy Goldberg Fishman Fishman follows an observant family through their preparation for the holiday as they put away schoolbooks and briefcases and make ready to welcome the Shabbat Queen. The origins of a variety of rituals are explained through questions the children ask during the course of the celebration. The narrative reads more like nonfiction than a story, but the writing is clear and straightforward. The illustrations are the highlight of this book. The blues and purples of evening juxtaposed with the white and gold of candlelight truly invoke the joy of Shabbat. The expressionistic works are reminiscent of Marc Chagall's work, with central human figures against a tapestry of shapes and Hebrew letters. A good choice for holiday collections. The endpapers, picturing ocean waves, a shtetl, and the Sabbath Queen, give a sense of Shabbat's timelessness and the restorative peace this weekly Jewish holiday brings. Fishman introduces a contemporary, observant family hurriedly preparing for the celebration on Friday evening, tossing schoolbooks and work into a closet, where everyday problems will also be stored until after the Day of Rest. They welcome the holiday with blessings, songs, and a festive meal; attend synagogue; spend time together during the leisurely Shabbat afternoon; then mark the end of the celebration and the beginning of the new week with a simple Havdalah ceremony. Yiddish and Hebrew words are defined in a glossary, allowing the text to flow smoothly. Hall's marbled, multilayered collagraphs are alive with intriguingly textured images. Inked in velvety golds, greens, blues, and purples, with mixed media accents, they radiate the warmth, comfort, and refreshing strength identified with the holiday. Fishman is the author of several other books on Jewish holidays, among them, On Hanukkah. Every Friday afternoon, as her father comes home with a bouquet of flowers and two loaves of fresh-baked challah bread, a young girl knows it's time for Shabbat, the most important Jewish holiday. Shabbat celebrates the day God rested after creating the heavens, the Earth, and everything on it. On Shabbat, her family lights the Shabbat candles and invites the Shabbat Queen to come into her house. They sing songs, receive blessings from each other, and have a special meal. The next morning, they worship at the synagogue, and in the afternoon, they study the Torah and play games. When they see three stars in the sky, it is time for the Havdalah ceremony, which ends Shabbat, and a new week begins. Cathy Goldberg Fishman's warm text and Melanie W. Hall's bright, sensitive paintings introduce young readers to the rituals of this weekly holiday. By Michelle Shapiro Abraham From the author of Good Morning, Boker Tov and Good Night, Lilah Tov, Michelle Abraham�s latest book introduces preschoolers to the joy of Shabbat. In simple, rhyming language, Shabbat Shalom! tells the story of family celebrating Shabbat. . Filled with prayers and beautiful illustrations, Shabbat Shalom! is a wonderful way to teach toddlers about lighting Shabbat candles, reciting the Kiddush, saying the blessing over the challah and more.Abraham�s educational books for preschoolers are proven successes, making learning fun and exciting. Shabbat Shalom! is the perfect compliment to the Morning/Bedtime Rituals books, creating a strong start to leading a Jewish life. Mrs. Moskowitz and the Sabbath Candlesticks "You call this a home?" Mrs. Moskowitz asks her cat as they walk through her new apartment. She misses her old house, filled with family memories. But then her son brings her a box that she left behind. Mrs. Moskowitz finds a pair of tarnished Sabbath candlesticks in the box. Those rediscovered candlesticks and her memories of past Sabbaths help transform her apartment into a home. By Deborah Bodin Cohen God is likened to a great artist with boundless creative inspiration in this lively version of the creation story. Making her children's book debut, Cohen, a rabbi, describes God's amazing handiwork: "Like a potter, God formed desert canyons and riverbeds.... Like a painter, God colored the leopard's spots, the zebra's stripes and the panda's black-and-white patches." The creation of nature's landscapes, animals and "a boy and girl in our image" require bounteous energy. God, though very tired, continues working day after day, until late in the afternoon on the sixth day when "at last, God was satisfied." On the seventh day, God announces "It is time for Shabbat" and calls all the world he has fashioned to celebrate with song, prayer and a grape juice toast of "L'Chayim-To Life!" Cohen's text expresses a joyous mood of appreciating wonders provided by God and being mindful of giving thanks for such gifts. Hall's (On Hanukkah) mixed-media compositions swirl with color and energy. Her palette balances purple sunsets, fluffy white clouds and verdant fields and mountains all in a vibrant, appealing rainbow of life. This book features bright colors to illustrate the wonders of creation. G-d is compared to a potter, a painter, and a musician on each of the days of creation. The text is best geared towards older preschoolers and can be sometimes hard to read against the dark background. A good supplement to the story of creation. By Surie Fettman Donny and his sister, Dina begin to set the Shabbos table with one silver kiddush cup, two challos - and end with ten napkins! In the process, preschool children can identify familiar objects that grace the Shabbos table and learn the numbers from 1 to 10! A special chart at the end of the book reinforces the concept of counting for the very young. (Ultimate Sticker Books) Annotated with factual information, each book contains more than 60 full-color, reusable stickers so children can create their own fun scenes. Tales for the Seventh Day : A Collection of Sabbath Stories An inspired storyteller and researcher, Jaffe (The Mysterious Visitor: Stories of the Prophet Elijah) delivers seven tales, each tied into the Jewish Sabbath but reflective of different cultures and times and of different moods. Jews from a range of backgrounds as well as non-Jews will appreciate her careful introduction outlining the concepts of Shabbat; within the body of the collection, too, there is something for everyone. The daughter of a Sephardic family matches wits with a clever nobleman (their contest ends with a happy marriage); the simple-minded Mottke, sent to buy a chicken for the Sabbath meal, returns with a glass of water and a long explanation. More serious stories include a tale from Ethiopia that can be traced to the Babylonian Talmud, about a laborer rewarded for his steadfast faith and hard work, and an entry about a devout girl who finds herself the guest of the Sabbath Queen. Jaffe is adept at creating diverse settings, and her prose, while highly polished, has the immediacy of oral presentation. Concise source notes as well as a glossary and an extensive bibliography can help readers adapt this lively work to a variety of uses. This satisfying picture book depicts a family's celebration of the Sabbath. Narrating the story is a girl who spends Friday with her grandmother and helps her prepare for the family gathering. The softly shaded watercolor and pen-and-ink pictures are lit with touches of jewel-bright color Their clean, orderly look reflects the child's pleasure in the orderly chain of events with Nana: tidying the house, polishing the candleholders, making the challah bread, enjoying a picnic in the park, preparing dinner. Then the extended family arrives and gathers around the table, where Nana lights the candles and whispers prayers. Everyone eats and talks, enjoying one of many "Friday nights of Nana." The words and pictures are quiet, yet precise and sustaining. Well-chosen details recur. Flowers bought in a shop later grace the dining room table; the park seen through Grandma's window becomes the picnic setting. And the motif of windows recurs throughout the book, ending as the child-narrator looks out at the snowy night, as the reader looks in on the family. This nostalgic look at the Jewish holiday of Shabbat, although somewhat message driven, is mostly successful. Young Jennie describes her day with Nana as they prepare for the evening. They bake, cook, shop, and spend time together. Finally, all is ready, the family arrives, the candles are lit, and they celebrate the Sabbath. The story is slight, but Hest captures the child's voice and the little details that a youngster notices, as well as the impatience to do the things she most enjoys. The delicate watercolor and pen-and-ink illustrations marry well with the text, and Nivola's use of vibrant blues and purples serves to accentuate specific details and descriptions. The artwork's homey, old-fashioned feel fits perfectly with the tone of the story. The family is clearly Orthodox, but the sentiment speaks to anyone looking for a story that re-creates the ambience of this family-oriented observance. As one of the better books on this largely overlooked topic, this title will certainly fill a need where Jewish-themed stories are in high demand. A warm and tender depiction of preparations for the Jewish Sabbath by a girl and her grandmother. "Today I have no school!" Jennie exults, and begins the day in Nana's kitchen eating bread and jam (peach, their favorite). But there is work to be done: the china washed and the tablecloth ironed; challah and pie to bake; flowers to purchase (violet-colored, their favorite). The day darkens, the snow comes up, Nana and Jennie dress in their blue Sabbath dresses, and the whole family arrives-shedding boots and scarves-aunts, uncles, cousins, and the girl's parents and her baby brother. The "best time" comes when Nana and Jennie light the candles and Nana whispers the Sabbath prayer. Watercolor and pen-and-ink illustrations are done in an almost folk-art style, with wonderful stippled patterns in fabric, rugs, and tableware. Touches of deep blue appear in everything from flowers and fruit to dishes and clothing. Nana's house has wood floors and interesting carpets, lovely pictures on the walls (echoing well-known artists), books on the shelves, and a palpable air of comfort and grace. Children will be seduced by the rhythm of preparation and ritual, and the reassurance of bread and soup and everyone talking "at the same time." 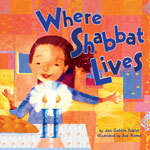 By Katherine Janus Kahn and Sally Springer Even the youngest can get ready for Shabbat! Simple activities centered around tzedakah, candles, kiddush, challah, and the day of rest. With a full-color centerfold board game, and a picture story of creation. By Camille Kress The Jewish Sabbath is introduced to little ones in this board book. The story, told in the first person by a young boy, describes candles burning, challah baking, and the peace of Shabbat. It ends with the prayer "Hear O Israel: / the Eternal is our God / the Eternal is One!" Simple and engaging, the book features dreamy watercolors that suit the serene mood.